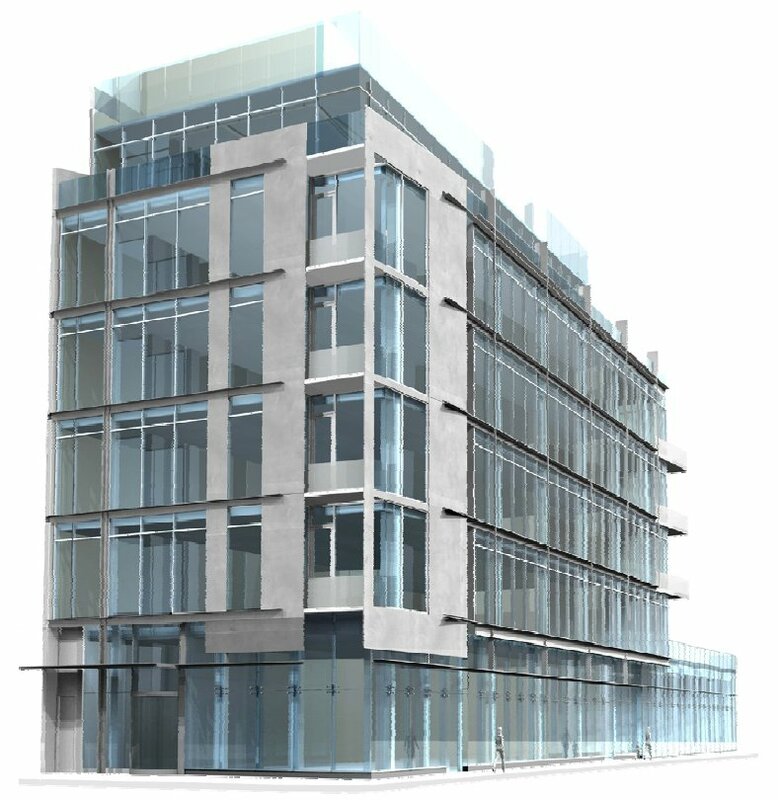 Yesterday, Ironstate Development filed permits to construct a nine-story, 46,000-gross-square-foot office and community facility building at 363 Lafayette Street in Noho. The long-vacant parcel spans the entire block front of Lafayette Street between Bond and Great Jones Streets and sits adjacent to the to the live/work studio of renowned artist Chuck Close at 20 Bond. 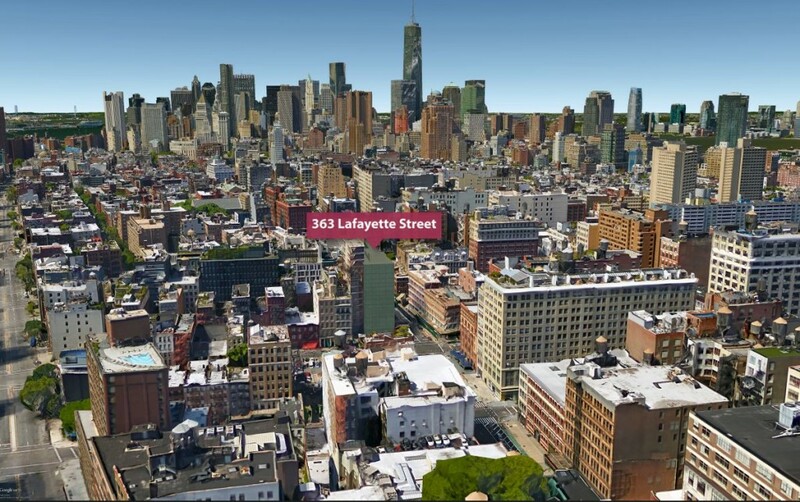 The Real Deal reported in 2008 that Close filed a lawsuit against the previous property owner, Olmstead Properties, to prevent the construction of an office building that would block the loft building’s natural light, which he argued many of the artists inside depend on. But the project seems to be moving ahead. 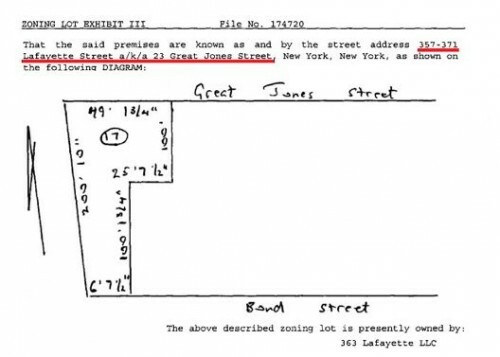 The irregularly-shaped 5,500-square-foot lot, with a narrow seven feet of frontage along Bond Street, is the result of the extension and widening of Lafayette Street between Houston and Great Jones in the early 1900s. Over the past few years several of the sheared-off parcels have been redeveloped, including Selldorf’s ravishing-red 10 Bond Street and Morris Adjmi Architects’ industrially inspired facade at 372 Lafayette. Ironstate’s plan calls for an even larger building than envisioned by Olmstead, with nine stories instead of six, reaching 127 feet in height to its highest occupied floor. 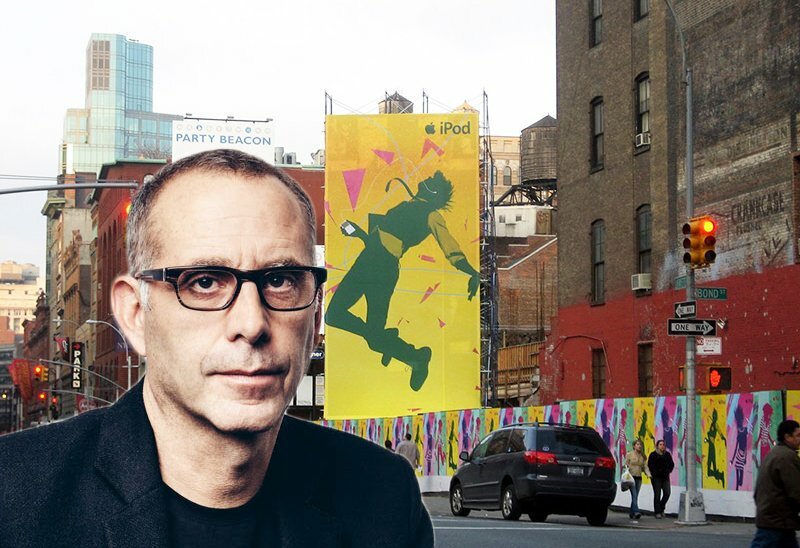 The always contextually-attuned Morris Adjmi is listed as the architect of record, and the site lies within the Noho Historic District meaning the design will need the approval of the Landmarks Preservation Commission. The breakdown of the the building’s program submitted to the buildings department shows the first three levels having space for community facility use, with the sixth level used for office space. Over the past few years, Ironstate has been expanding its rental portfolio closer to the city center. The David Barry-led firm is currently involved in more than $1 billion residential, hotel and mixed-use projects, including the 900-unit URL Staten Island and Jersey City’s URL Harborside.